Taylor Wiseman and Taylor (TWT) provided complete Design Services for the rehabilitation of the existing three-span steel bridge over the Schuylkill River that connects Lower Merion and Manayunk, PA. 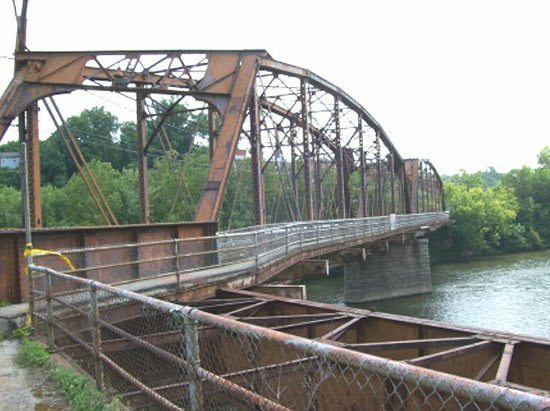 The structure, originally built in 1900 as a railroad bridge, consists of two 183-foot truss spans and one built-up through-plate girder span. The plate girder span consists of variable length girders made up of 10-foot deep web plates and multiple top and bottom flange cover plates. 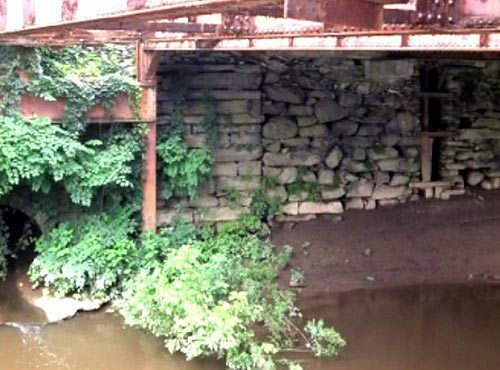 The developer proposed to re-utilize the bridge as a single lane structure to provide easy access from the developed site in Lower Merion to the trendy Manayunk portion of the city. The single lane bridge would be used for two-way alternating traffic controlled by signals. Re-use of the bridge was considered essential for the viability of the proposed development. The project included the extensive structure repairs to the bridge truss components, repairs to the thru girder span and parking deck area, cleaning and painting of the deteriorated steel bridge, installation of a new bridge deck with a separate pedestrian/bicycle walkway, installing new bridge bearings, relocation of the existing overhead aerial utilities into bridge mounted conduits, abutment repair and reconstruction, installation of a new sanitary force main and the provision of safety features such as an approved guide rail system and bridge/pedestrian railings. 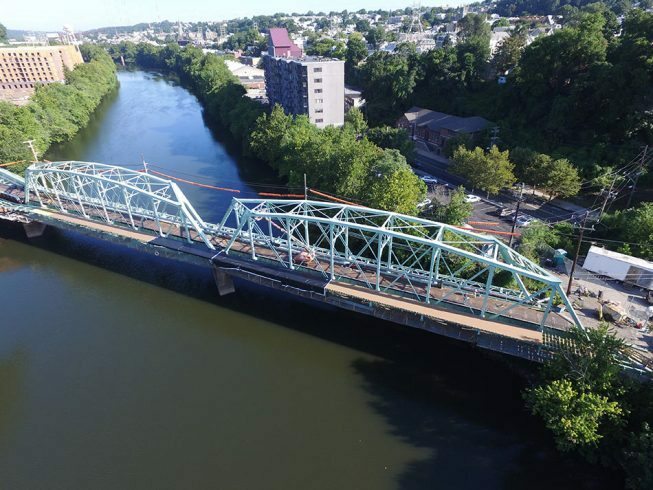 Design services included survey/base mapping, development of as-built drawings for the bridge utilizing 3D laser scanning performed from an adjacent rooftop, extensive hydrology and hydraulic analysis of the Schuylkill River and watershed, in-depth structural inspection and rating of the bridge components, complete final construction contract documents; and construction services. 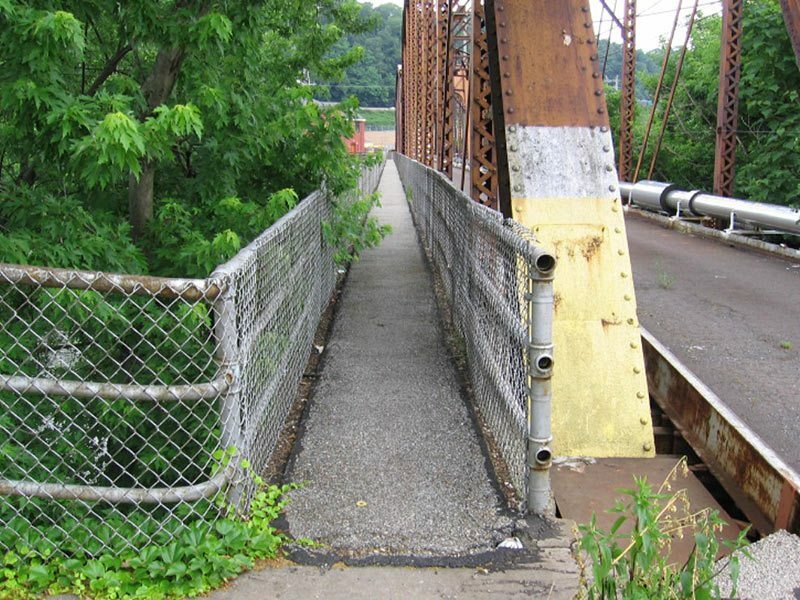 Construction services included the re-inspection of the bridge after cleaning to re-evaluate the proposed repairs, physical mark-out of specific repair areas, and to prepare numerous Changes of Plans (on an accelerated schedule) to address unforeseen structural deterioration and bridge modifications in inaccessible areas of the bridge that are now exposed. Services also included coordination and review of all shop and working drawings, construction inspection during structural steel repairs and bridge bearing replacement, working closely with the bridge owner to evaluate repair cost changes with the Contractor, and attendance at weekly meetings to help maintain the construction schedule. Bridge construction is currently underway, beginning in June of this year with the scheduled completion date in May 2015.